Pipilotti Rist (Zurich, Switzerland), Open My Glade (Flatten), 2001, 9 – 1 min. video projections, Berlin Tower, Kitchener City Hall, Kitchener. Photo: Isaac Applebaum. The 9 one-minute video segments of Open My Glade were originally commissioned for the NBC video screen to enter into a dialogue with the multitude of high-tech screens and commercial billboards overlooking Times Square. Rist's collection of videos will appear in slow motion, relaying poetic visual statements through close-ups, flying camera work and intense colour. Open My Glade will only be available for viewing after dusk. As kids, when we were bored and riding in the back seat our parents’ cars, we pressed our noses and lips up against the rear passenger window and made faces at the passing traffic. In Pipilotti Rist’s video, she does essentially the same thing. In real time and in slow motion, forward and reverse, with and without make-up, she appears to press her face up against the picture screen. The result is a series of humourous and haunting and (for some, disturbing and sexually charged) silent facial distortions, ideally suited to the tower. 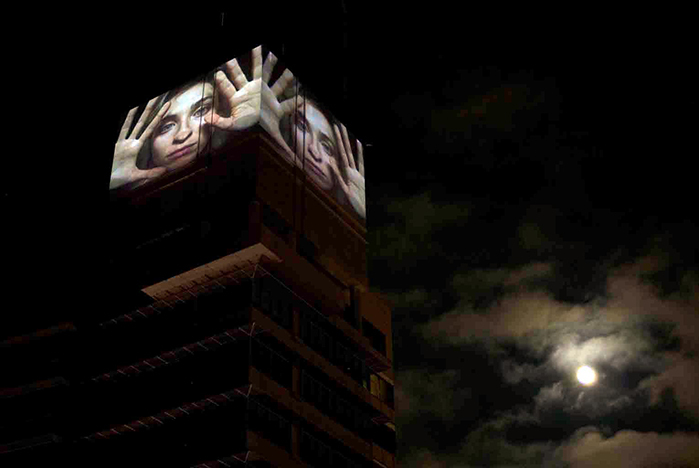 The images projected equally to those viewing from distant parts of the city as well as to those viewing the images on the street in front of the city hall. The specific location of the projections on the two sides of the tower's mechanical room lent additional significance to the claustrophobic sense of enclosure and entrapment that the artist created in her theatrically vain attempts to break through the screen, perhaps commenting on our own dependence and captivity to screens of all types in our daily life. Perhaps too, in the context of the commercial glamour advertising which typically occupies large urban screens, Rist's violent smearing of her make-up and her strange facial distortions can be interpreted as a soundless scream of isolation and desperate resistance directed against our contemporary obsession with glamour and celebrity. Born in Switzerland in 1962, Pipilotti Rist studied Graphic Design and Photography at the Academy of Applied Arts in Vienna, then Video at the School for Design in Basel. Switzerland, Professor René Pulfer, 1986-1988. Rist is known for her “freestyle video and audio works and installations, which she has been exhibiting since 1986. From 1987-1994 she free-lanced in computer graphics for different industrial video studios. She was a member of the music band Les Reines Prochaines, from 1988-1994, visiting professor at UCLA, Los Angeles CA, 2002-2003, and from 2005 – 2009 she worked on her first feature film, “Pepperminta.” Since 2004, Pipilotti Rist has lived and worked in Zurich and in the mountains of Switzerland.